We took a whirlwind road trip to CA the other week. First we went to the bay area so that Steve could work a few days at the CA office. While he did that I ran errands but that Monday I was able to drive to Berkeley to meet a flickr friend, Marilyn/Spiced Coffee. We forgot to take pictures but we did go to three different fabric shops, Stone Mountain and Daughter, New Pieces, and A Verb For Keeping Warm. We also had lunch at a little grill near the New Pieces shop. It was lots of fun and always nice to meet someone you've only known from online groups. Marilyn is the recipient of my Aurora Borealis quilt from the Fab Little Quilt Swap. Here's a couple of interesting fabrics that I got at Stone Mountain and Daughter. Marilyn had found the bunny fabric and I had found the dots fabric. They looked so good together that I just had to get a little of each. I'm thinking they'll make a fantastic tote bag. I just need to find a fantastic grey to go with them. A Verb For Keeping Warm is mostly a yarn shop with a nice selection of prints. They dye their own yarn so if you're really into knitting/crocheting go check them out. The thing that I was most thrilled with was the small swatch of pre-stenciled cotton jersey so that you can practice the Alabama Chanin technique. I can't wait to try this out! The dogs loved being back in Sunnyvale, mostly because they got to play in the backyard and got to visit with their cairn terrier friends from the neighborhood. We then drove down to LA so that we could visit Steve's aunt who's in a convalescent home recovering from a few weeks in the ICU. We didn't have much time to stick around and sped off towards Vegas and then home. Nope, we didn't stop to gamble in Vegas but we did let the dogs play at the dog park for an hour. (They were getting so cooped up in their crates.) We're fortunate that the dogs are good travelers but next time we'll bring the RV instead of the car. It's hard to find hotels that will allow dogs and they're not that cheap anymore. It would have probably cost the same if not a bit less to have our RV even with all the gas it takes. Lesson learned. We did get to take a quick detour and drive through Zion National Park after Vegas. Gorgeous!! Pictures to follow soon. So now we're back in Cheyenne. We got one more week of temperate weather to recover from our trip, but this morning we awoke to snow. Yes you read that correctly, snow!!! I guess summer is beyond being over in this part of the US. A few weeks ago I entered a design for this year's fabric8 design contest sponsored by Robert Kaufman and Spoonflower. The theme was Geek Chic. At first I thought of funky glasses but after quite a bit of sketching decided that wasn't good. (Thank goodness I didn't do that because there were a lot of designs submitted with glasses.) All I could think of for the theme was computer related. When I was in high school I took a computer class and learned how to program in Basic and Pascal on a Machintosh IIe desktop. (Yes, I was an 80s teenager.) That did it, I had to figure out something interesting with computer code. Whenever you learn a new code there's a program called "Hello World" that you do so that you'll understand the differences between the old and new codes. That's what my design is all about ... I even included the binary code for "Hello World". This morning I found out that my design didn't made it to the semi-finalist round. Too bad, I would have loved to make the coordinating fabrics to go with it. Perhaps I still should and then I could make a Geek Chic quilt. At any rate, go take a look at the semi-finalists here and vote for your favorite. Thank you everyone for voting for my print! Unfortunately I didn't make it to the top ten but I do appreciate all of your support. The competition was stiff and the top ten are outstanding prints. Congratulations to all 968 contestants who entered the Michael Miller/Spoonflower Project Selvage fabric design contest. Wow! I can't believe it but my fabric design for Project Selvage (the fabric contest hosted by Michael Miller and Spoonflower) has made it to the first cut of 75 designs out of a total of 968 entries!!! Please, please vote for my design so that I can make it to round two where I'll be able to show a collection of six baby boy fabric designs. You don't have to sign up, just click on my design (as seen above) and then go to the last page of entries, fill out the captcha and then hit the button. That's it folks! With your help I can get to the next round and show more designs. Thank you!! Okay, now I'm going to get a cup of tea to calm my nerves, I'm soooooo excited I can't tell you. Last night at doll club, we held a Stash Basket Silent Auction. 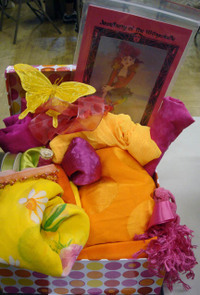 Members donated baskets (or any type of container) with some type of stash .. fabrics, trims, patterns, etc. This was the one that I came up with. I'm definitely attracted to these vibrant colors but it was time for these fabrics to go to a good home. Some of them have been around since I went to college! The orange polka dot is what's left after making the lining for the orange leather jacket. (Oh yes, I made a leather jacket complete with five zippers! I'll have to get it out one day to show you.) Hmm, there's also the little bit of hot pink raw silk that's left over from my very first design project. Then there's the yellow mesh that was used to make a swimsuit cover-up. I sold the matching yellow lycra on ebay to a fellow who has an ebay business that makes/sells specialty men's swimsuits. You know what kind I'm talking about right? ;-) Finally, there's a pattern included that I never got around to making. It's one by Patti Culea and I already have quite a few of her patterns and books so one for donation won't be missed too much. It was so much fun pulling things together from my stash. Hopefully the winner will think that it was good too.